USB Hidden Copier copies all the content of all the USB drives that have been inserted in the system and will save it to the hard drive. This process is invisible and the user doesn’t know that his or her content has been copied. You can read about v1.0 here. 1. Added feature: You can choose the folder where the copied content will be saved. 2. Added feature: You can start copying immediately by pressing Alt+C. will not be accepted and will not have any effect. 3. Added feature: To close program (Exit) you can press Alt+E. notified for this by a triangle icon in notification area, showing/hidding for 1/2 sec. 4. It is more easy to use now. Buttons are enabled/disabled to tell you what you can click! take other aditional files with you when you travel anywhere. shows up as a trojan? samildanach, Please tell us how you’re scanning the file? Which tools are you using so that they are giving it as a trojan? samildanach, it does only the task that it was written for: Coppies the content of usb drives inserted into computer and saves that content to hard disc, for you to access it later. Nothing else. I have sent it with the source code here but the source code was not published by admin, maybe becouse there was not any interess about it. But if anyone like to have the source code and the latest version from me, just let me know by writting a coment here! Thanks to all those that have downloaded and like it. Hi , i am spanish, and i´,m not speak english very well, sorry…. the program dont work correctly in mi PC .. when I use the pen drive.. the Program dont read F: or E: , else A: … disquettes….. and show me a error in screen : " no hay disco en la unidad. inserte un disco en la unidad. CANCELAR REINTENTAR CONTINUAR..
somebody can i help me. thank you for all ! Juan you should be registered to Technize to download beta version of Usb Hidden Coppier. which is available to download only for registered members. In beta version, all bugs reported until now, are fixed, included the “floppy disc bug”. Thanks to all people that have downloaded my program. Listed below is basic information about the detected application/process. This application may not be safe to have on your system. Description : Trojan that may log user information and possibly block access to certain security related sites. I am not able to download this software. it says “file not found” on the download page. can you give me an alternative link pls? fast reply will save lives here. thanks in advance. ur idea is very good.but i didn’t find any links for either download this usb hidden copier or source code file lin.bocz ur said we may edit your source code. please reply me for my email prasad.learner@gmail.com,,,,,it’s very urgent forme.please respond to me…………….. Cannot access the download webpage, can anyone send it to me please? mcifi@hotmail.com Thanks! or a download link? can you send me the link for downloading your software.. Thanks for the program Thats Awesome!! I have a problem. The computer I want to use it does not gives me administrator rights to install the program. Can you help me out with this? I actually need a USB data of my instructor so that her USB is copied into the sysem and I can take it from the system later. Hasan I will make some experiments my self and then let you know. I will help you of course! could you send me the program? my mail is outsider_zn@yahoo.com. If you can also send the source code I will be more than glad. DarkCoffee, I just saw your post now and about your couriosity “if you insert an usb hard drive” I can tell that only 10GB are saved in computer’s hard drive, so if the usb inserted is bigger than 10GB, not it’s completely content will be saved. Hope you are cleared now. Problem solved, it was another program installed on Arci’s computer caused the window to appear. He sent me an email that confirms this. So that was a mistake of Arci’s. Thnks for the beutiful application whe i rucn it an annoying massage appers after some time.Disk not found.I am using beta verson.My cpu has an in built card reader. how can I have a sourse code to edit? could U send me a source code? my email xuannhtn@gmail.com thank so much! Dude, can send the nice program to me? thanks bro..
this is not a problem of my program I think, becouse it checks if all files and registry entries are ok, then tell you that it is installed sucessfully. Your problem may be caused by any other software that deletes the startup items, so check your system if you have installed any other security software that does that. thanks. and backup files to FTP server. Hello, I have a problem. Only one empty list is copied invested, however, not the contents of the list on USB embroidery one. What can I do? thanks for this nice programe, but i try it and no file has been copied even after i press start buttom ???? hii .. i am unable to install the program it says : something was wrong .program cant be installed.reg key deleted … can you help me ?? ”something was wrong.Program can’t be installed” …………..why ? Hey, i got the same problem, i installed and started copying it, but i try to run it again, and dont know how to, also i try to install it again and i get the “something was wrong” think, how can i fix it? anyone knows what this means? How unistall usb hidden copier? the program is blocked on “INSTALL”. Thank you! what do you mean with “blocked”? I was tinkering with the software on an older computer with Windows 2000 and it never worked correctly. Which is fine. But now it pulls up an “AutoIt v3: Windows – No Disk, Exception Processing Message c000013 Parameters 7cc31d6c 7cc31d6c 7cc31d6c 7cc31d6c” error box ever 10 seconds or so and the boxes are always on top of the screen. I’ve tried running the Control Panel.exe to install and then remove however, the software replies with an error saying “Something was wrong. The program can’t be installed. Reg key deleted!” and then closes. I would like to get the software out of this computer as multiple people need to use it. Thanks, I’ll be checking the forum for comments back regularly! Thank you for a very cool utility!! Is it a portable application (doesn’t need installation)? If you insert the same USB memory twice does it show the overwritten message or it just overwrite it? If I want to copy the USB memory only once (or if I insert more than USB memory and I only need to copy the first one) does it copy the USB memory and exit? 1. Yes, it is portable, but needs to install only once on the target PC because it will be running there. The “installation” is just 1 button click and takes less than 1 second. 2. No, it will never show any message, it operates completely invisible. 3. It copies the content in certain periods to ensure it has the latest updated content. .-= Altin´s last blog ..Easy Download Youtube Videos =-. It is not really portable since you can’t use it without installing it on the computer, which might requires administrator privileges in some cases. Is there anyway to make it work on this kind of restricted environment ? i just installed and its fine but whe some one insert his usb and the he unplug it and it was copying there qill be a mesage error so the person will know that ure doing it. is there a way to remove that mesage? hello. thanks for this great program. i ve installed it on my windows 7 x64. too see how it works. ran program with admins mode, installed it. but for a reason i can’t manage to copy files to my destination directory. a folder is created whic has the name of usb drive, but no files. anyway my real question is when i closed the program first time and started again (second time) uninstall button was deactivated. i couldn’t uninstall it. and i tried to install again to uninstall, i got a message says “bla bla reg key deleted”. i think it might be caused by my virus program. i restarted my computer and saw that program is still starting on startup. now please help to remove this from my computer. something was wrong. Program can’t be installed. Reg key deleted! i have windows 7 32bit, i installed it and it doidn’t copy anything for the first time, than i restarted and try to install it again but message appeared: Something was wrong. Programe can’t be installed. Reg key deleted! i wonder if its posible to uninstall the programe because its hidde? heh just noticed i’m not the only one with such problem. problem with hidden usb copier with autousbcheck. Him and I, we do not play well together and dont trust each other so we have both software on the same computer win xp pro. 1. usb hidden copier does not copy if autousbcheck is installed or is running. 2. uninstalled hidden copier and reinstall fine but as soon as I click on the red X box to exit hidden usb copier of the control panel the “systemidle.exe disappears in the windows task manager. open control panel and click start and “systemidle.exe is running in windows task manager but as soon as click red X box it disappears and does not copy. 3. systemidle.exe does not run on restart. Hi, i have to tell you that it is a very nice program BUT after i’ve installed it on the pc, where can I find it? because now i have to remove it otherwise they will find out. 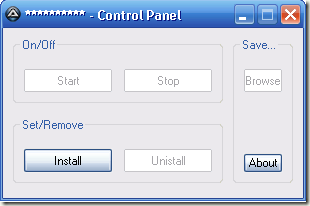 If you want to remove (I mean uninstall) yo can do so from IT’S control panel. This not working, Then try copy usb disk contents any folders? Why? The software seems interesting and buggy, ill still try it. But a nice feature to add, is an ftp mode and hidden msg boxes. Your program is not working on my pc. I’ve windows xp. But it seems your program takes drive letter A as default but in my pc letter A is assigned to floppy drive while in my pc letter J is for USB drive. So pls tell me how to make your program run on my pc. I need your program badly. this is fixed in latest version 1.11. Also please Sanix update the old version with the new one or do a redirect to it so all can download the latest version. I see most of downloads are in old version. Thanks. I downloaded your latest version but it still doesn’t work. And one more thing my boot (main) drive has letter G. Can that be the possible reason. Pls solve the problem. @dynamic, it has nothing to do with which letter has your boot drive, it may be another issue. Do you get any error when installing or uninstalling it?? Try to uninstall it first, then use the last version..
Well, I notice one thing that the program runs when you insert the pen-drive immediately after the startup (booting), but it doesn’t work when u insert the pen-drive, say after 1/2 an hour or one-hour. And, there is no error message at-all. So can u tell how to make the program run automatically whenever u insert the pen-drive. one more thing is that the program automatically stops after, say 4-5 minutes, of statup and I have to start it again from control panel. THe program seems to stop every now and then. I have to start it every few minutes from the control panel. Could you please look into this? Also, autostart with windows isn’t working well with me. Can i drag a shortcut to the autostart folder? Thank you. Also, autostart with windows isn’t working well with me. Can i drag a shortcut to the autostart folder? When I reboot my PC I must restart USB Hidden copy manually. Thank you. Thanks for the nice program.. It actually worked on my XP computer..
is there a solution for this problem?? thank you..
guys all these are done using java language in just of 200-250 LOC . Your software is very excellent. but he copy personal Usb in my computer. Sir you say, put a file in his personal Usb. “Friendflag.windowxp” is not met. kindly include this file with software zip. Thanks ALTIN, this is a great software. I have downloaded latest version 1.11 beta but still “systemidle.exe” turn off itself after 3 minutes if no usb device is connected and does turn on again when usb device is connected Please Help!! I am using WinXp with Service pack 2, anti virus not installed. I have downloaded latest version 1.11 beta but still “systemidle.exe" turn off itself after 3 minutes if no usb device is connected and Does NOT turn on again when usb device is connected Please Help!! Hi Altin, do you have any solution for previous problems ?? I mean this: something was wrong. Program can’t be installed. Reg key deleted! This is fantastic work. Could I please have the source code? I’d greatly appreciate it. Hey Altin its not working in windows7 ultimate,it shows ERROR…. WHY NOBODY ANSWER THE COMMOM PROBLEM HERE??? SEE HOW MANY COMMENTS HERE ABOUT THIS ERROR!!!! ZERO RESPONSES! THIS ONE IS THE LATEST VERSION THAT EXISTS. And this little software is not anymore in development. At least I don’t have any plan for that in near future. Provato su win7 con avira antivir. Seguita tutta la procedura, fatto tutto bene, ma nella cartella che ho indicato io non c’era assolutamente nulla (ergo non ha copiato niente). Provato ben due volte.